Perfect for Thanksgiving, or Christmas Dinner, or for your friend Judy’s birthday, or for your husbands 40th birthday, or for my birthday…please make it and send it to me at your earliest convenience. Now don’t be nervous if you have never tried making cheesecake. You do need to have an 11 inch spring form pan and about 90 minutes to hang out while the confection bakes in the oven. You know, you could like…paint your toenails or practice your spelling words or something while it bakes. What I meant to say is…you could help your children practice their spelling words. It’s also important that the finished cheesecake has time to chill in the refrigerator overnight. 1. Toss the gingersnap cookies into a small food processor. Grind them all up. Stir it all together with a wooden spoon, until all ingredients are combined. 3. Press the crust into an ELEVEN INCH spring form pan with a small measuring cup. It’s important that you have a pan big enough for this recipe. 4. Bake the crust at 350 degrees for 8 minutes. 1. Put your softened cream cheese into your stand mixer, or large mixing bowl and beat until it’s nice and smooth. vanilla, dash of salt and the sugar. Beat until well combined, about 2 minutes. 3. Add the eggs, one at a time, beating only until each is combined. Don’t over mix. 4. Pour about 2 cups of the filling into the crust. You just want to pour enough so that the sides of the crust are almost covered. 5. Measure out your canned pumpkin. Into the measuring cup pour the ginger, cinnamon, nutmeg and cloves. Stir it all around to combine. 6. Pour the pumpkin mixture into the remaining filling and stir it well making sure everything is combines well. 7. Pour the pumpkin filling over the top of the plain filling. 8. Pour about 2 cups of water into a 9×13 pan. Place it on the bottom rack of your oven. Put the cheesecake on the top rack and bake, uncovered for 90 minutes. When done baking, the cheesecake should look golden brown around the edges, but will still be a bit jiggly in the middle. This is fine…it will keep cooking a bit as it cools down. 9. Set the pan on a wire rack and let it cool completely. Cover with plastic wrap and refrigerate overnight. This is the Caramel Sauce I recommend. 10. JUST BEFORE SERVING, pour the caramel sauce into the middle of the cheesecake. 10. Pipe some cool whip around the edges, cut and serve. OH MY GOODNESS!!!! Did that really just say my name!!!!! I can NOT believe that!!!! I am so so so excited!!!! Jamie really? I am in shock!!!!! WOW!!!! I am calling my sister in laws right now!!!! Thank you thank you!!! Let me know what you need from me. This looks great! I cant wait to try it! I won, I won, I won, I won, I won!!! Yippeeee! I have needed knives for a while….yay! Merry (early) Christmas to me! I'm seriously doing a happy dance right now! I already called my husband and told him we are getting new knives. Woo hoo…oh seriously, you don't even know how excited I am!!!! Keebler Butter Pecan Shortbread cookies also makes a wonderful crust!! Did you really mean 1cup of vanilla? That's way more than I would think. Maybe 1 tsp? One Cup Vanilla!!! Thanks for the heads up. You are right, it only needs 1 tsp. Thanks for pointing the error out to me. Oh my! 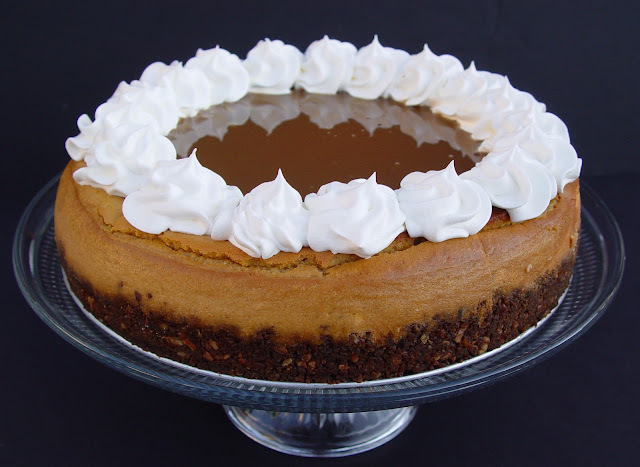 I'm definitely adding this to the Thanksgiving menu…that is if I can wait that long to try it! This looks amazing! You're my new favorite food blog! Can't wait to try this cheesecake. My husband's B-day is a week away, I need to know where you bought your 11 inch spring form pan. I have a 9 inch and otherwise have only seen 10 inch ones. 9 and 10 inch do seem to be the most common. I ordered my 11 inch as part of a three pan set online. However, several years ago I purchased a similar set at a Kitchen Kneads store. If you have trouble finding the 11 inch pan, I would suggest using the 9 inch pan your have…but only using about 2/3 of the filling. You could cook the extra filling in some muffin tins lined with cupcake holders. Good luck! Hope this helps. PS…I can't remember where I ordered my set from but I searched a little on Amazon and they have some sets that would work. Also..here is a link to an 11 inch pan from Amazon. Thank you for you quick response about the pans. I enjoy your blog and the recipes that you share. I just made this, and other than using 10Tbsp butter (instad of 6), it is REALLY GOOD!!!! Thankfully I had some graham crackers so I mixed those in with the gingersnaps. It seemed to work out just find. I'l find out when I get to work in a little while. :) Hubby liked the one little sliver I gave him to taste test. I used a 10-inch pan and seemed to work just find. Check you out! So glad it turned out well. I really enjoy your blog and recipes. Thank you for what you do. 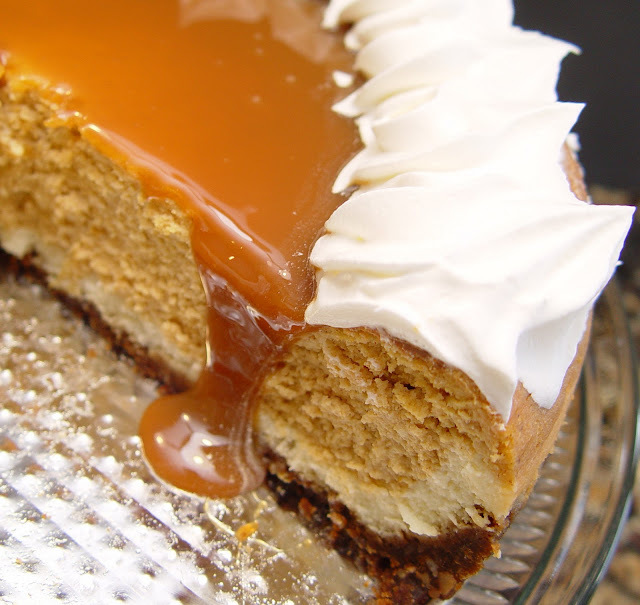 I’m wondering if this pumpkin cheesecake is freezable, like the toffee cheesecake? What’s the best way to store a cheesecake in the freezer? Thanks! Yes, this cheesecake will freeze well. 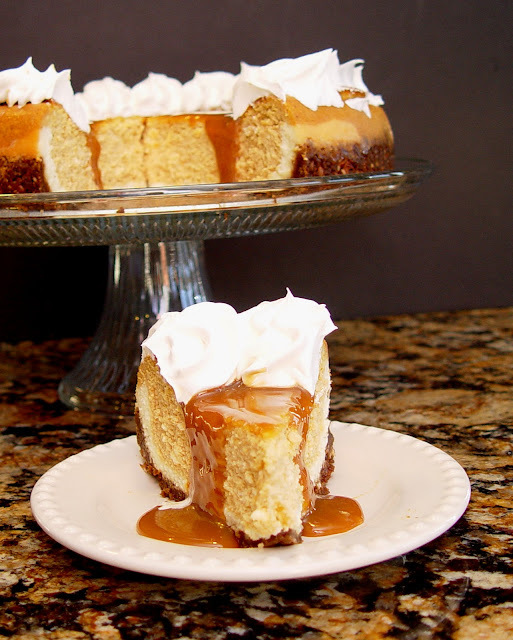 Don’t add the caramel or cool whip to the top until you are ready to serve it. After it has cooled, I generally just freeze cheesecake in the same pan I baked it in. I wrap the whole thing tightly in foil. Good luck! Hope you enjoy it. If I left out the pecans (due to nut allergies) what should I replace them with? More gingersnaps? Yes, just add more gingersnaps. Good luck! Yah, he plays so much and is like, making a linivg out of it. Donch know how he does it. He starts playing about 8pm (after work) until about 3-4am, sleeps a couple of hours and then goes to work. Everyday is like that. Help! Ready to put this baby in…cook at 350 too? canned pumpkin? I doubt that is sold here – never seen it and would never buy it. So is 1 cup of cooked pumpkin the same? Yes, 1 C cooked pumpkin puree would work out great.